This 3 berth campervan provides an economical way of sleeping in comfort and cooking a meal for up to three adult persons. 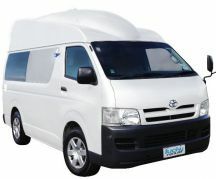 2004 Toyota Hiace is economical and easy to drive. Its compact layout features plenty of storage. Vehicle is certified self-contained. The Koru 4 berth offers comfortable living and sleeping space for up to 4 adults, with its features that guarantees a maximum of independence. The convenient walkthrough from the driver's cabin to the living area allows for easy access to the rear. The large rear window offers great panoramic views. Models VW 2006 or later models. This vehicle is certified self-contained. 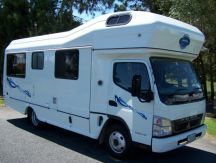 The Riviera is a spacious motorhome suitable for up to 6 people with 6 seatbelts. Plenty of storage, large shower and toilet area, with 3 double beds. 2008 Model. LCD TV standard. Solar panels and diesel fired heater. 4 x approved baby/child seat belt restraints which are situated directly behind the drivers cab. This vehicle is certified self contained. Toyota Hiace or similar, 2004 - 2005. Interior refit in 2010. The Lucky Rover is a 4 sleeper and boasts a cooker, a fridge and a kitchen. That’s pretty much everything you’d ever need from a camper. Trust us, this thing is the goods. Certified Self Contained - Can Freedom camp at designated areas. 2x child seats can be fitted into rear of this vehicle - 2x child restraint bolts. (Has 5 seatbelts but sleeps 4). Middle front seat has lap belt only. You are viewing page 4 of 28.